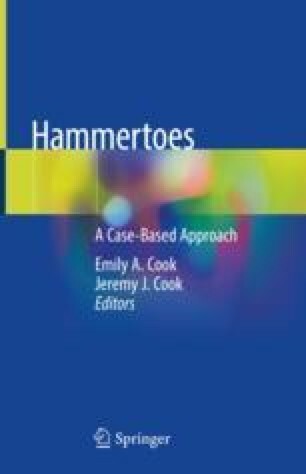 Hammertoe deformity is a common pathology seen by today’s foot and ankle surgeons. The deformity of the lesser digits is a frequently encountered pathology in foot and ankle clinics. Arthrodesis is accepted as the gold standard for hammertoe correction. Surgeons performed this by removing the adjacent articular surface of the proximal interphalangeal joint to allow osseous fusion. Soule first described the procedure in 1910, and Jones later modified it to utilize a more straightforward dorsal approach . In 1940, Taylor added the use of a Kirschner wire fixation for stabilization . This is a simple and effective method of arthrodesis which remains a steadfast most common technique and practice despite its anterior weaknesses [1–4]. With modern intramedullary fixation systems, the goal is to address or remove the concerns surgeons encounter with K-wire fixation. Specifically, in a study involving 149 toes and 99 patients, Richman and colleagues noted positive results for intramedullary devices over K-wires for hammertoe fixation . In discussing proximal interphalangeal joint arthrodesis for hammertoe correction, Ellington indicated a preference for intramedullary devices in order to avoid complications with K-wires .